This post walks through what Google My Business is, the benefits of using it, how to post, and some of the other features. 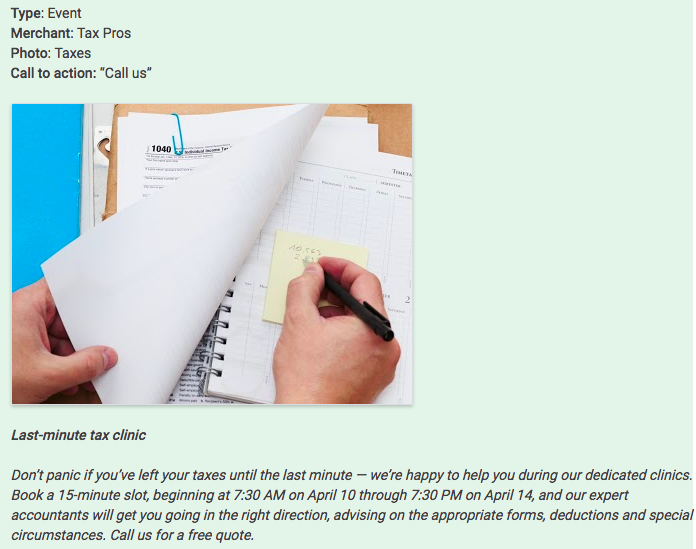 If you are already familiar with Google My Business, jump down to the How to schedule Google My Business posts section. One of the newest ways to market your business is through Google My Business, sometimes referred to as GMB. 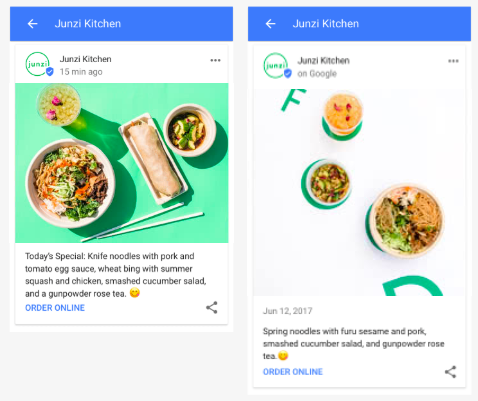 Google My Business allows you to stand out in Google search results by sharing photos, announcing sales or specials, posting what’s new, managing reviews, and keeping your contact information and open hours current. You have probably seen Google My Business results in your Google searches, even though you may not have realized it. Should I be using Google My Business? In short, yes. Google My Business is a free way to stand out in Google search results. Because Google My Business is relatively new, most businesses are still not using it yet. 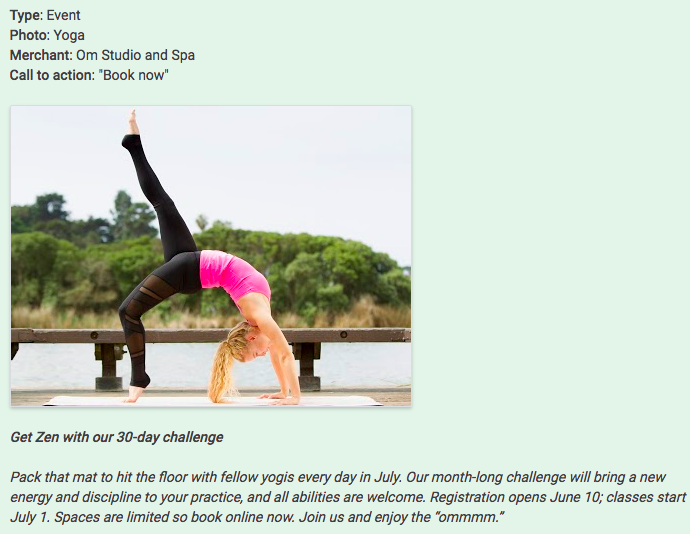 For those who start using GMB early, you can get a huge leg up on your competition. You are most likely already posting on social media, right? Well unless you are paying to boost your posts, your audience will probably be limited to only people who already follow you. However, with Google My Business, your posts have the opportunity to reach people outside of your existing audience. Does posting on Google My Business impact my search rankings? According to this study by Search Engine Journal, posting on Google My Business has a positive impact on your Google search results ranking. 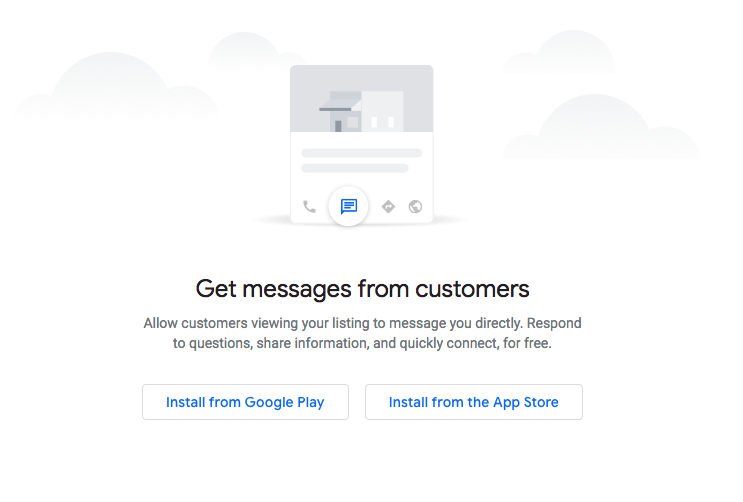 In addition to helping with Google search rankings, updating your Google My Business listing can lead to people choosing you over a competitor. Suppose you own a restaurant. It’s Monday and the weather is bad, so you know business is going to be slow this evening. You decide to run an extended happy hour deal from 4pm until close. You announce the deal on your Facebook and Instagram pages. Now you wait for all the customers to flock over. Right? But what if someone who doesn’t follow you on social media is Googling a few different restaurants, trying to figure out where to eat tonight? So we’ve established that posting on Google My Business is important. Now let’s look at how to post on Google My Business. Verify your business — Google will send you a physical postcard with a unique verification number to ensure that your address is legitimate. 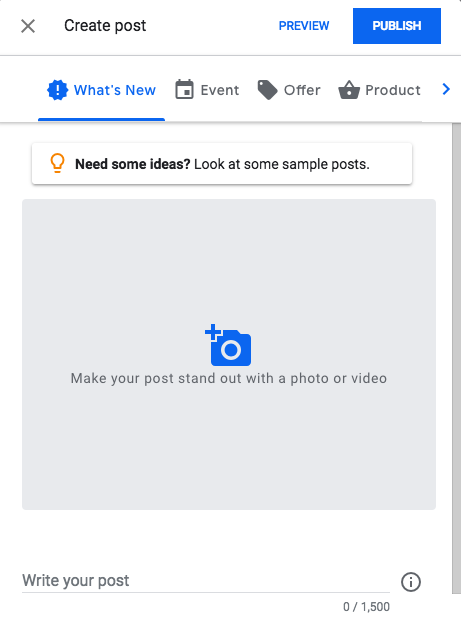 What’s new posts: Posts that provide general information about your business. 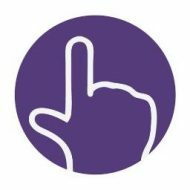 You can include a photo/video, link, Call-to-Action (CTA) button, and other information. 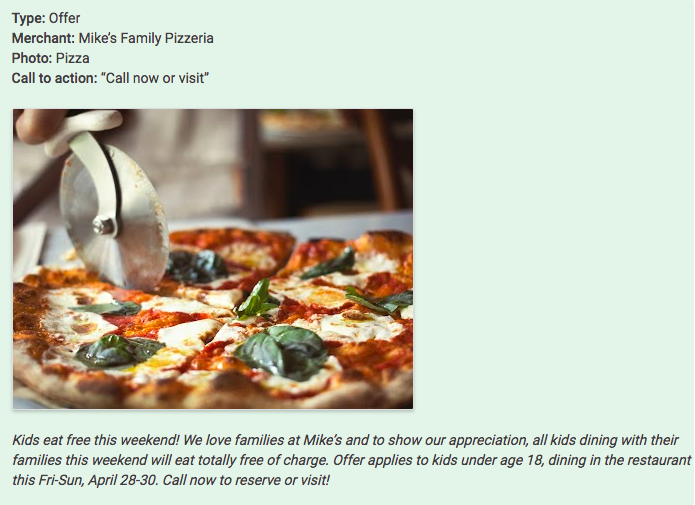 For example, a restaurant could make a post to promote a new menu item. You can also add a button to your post if you wish, which you can link to whatever you’d like. Overall, it’s a fairly simple process for posting on Google My Business. High-quality images of your product, food, location, service, etc. Choose a suitable post type: Is your post about an event? An offer or time-sensitive deal? Do you have news to share? Consider what you want your post to do — whether to encourage customers to visit your store, sell something, or announce a new feature. Photos: Take a high-resolution photo reinforcing your message so your post stands out. Photos should be simple, direct, in-focus and well-lit, with bright, vibrant colors. Photos should have a minimum resolution of 400px wide by 300px tall, in JPG or PNG format. Title (if your post is an event): Describe your event in 4–5 words. You have up to 58 characters for your title. More details: Be clear about your offer/event. You have up to 1,500 characters for the description of your post, but the ideal length is between 150–300 characters. When you post something on Google My Business, it will show in search results for only 7 days. The only exception to this is Event posts, which stay until the date of the event passes. When your post is about to expire, you will get an automated email from Google My Business. 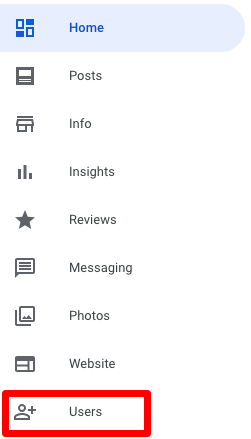 On each Google My Business post, you can see the views and clicks that the post has received. In addition, Google My Business shows you the actual search terms people are using to find your business. This is an extremely valuable insight. Search queries show the terms that your customers used to find your business on Local Search and Maps. You can filter the search queries by the last week, month, or quarter. Google My Business has so many other features that might be of value to businesses that it is hard to cover everything in just one post. 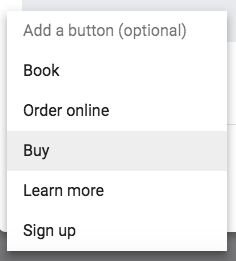 If enabled, Google My Business allows customers who are viewing your listing to message you directly. This can significantly minimize the number of phone calls or emails received. 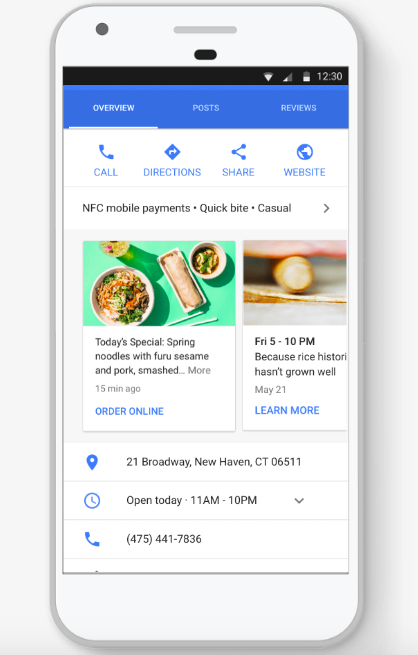 Google My Business wants to get everyone online, including businesses that cannot afford a website, or aren’t tech-savvy enough to build a website. So they created a simple website builder within GMB. But I already have a website. Do I need a Google My Business website? Good question. While it’s definitely not necessary, many people believe that having a GMB website helps. 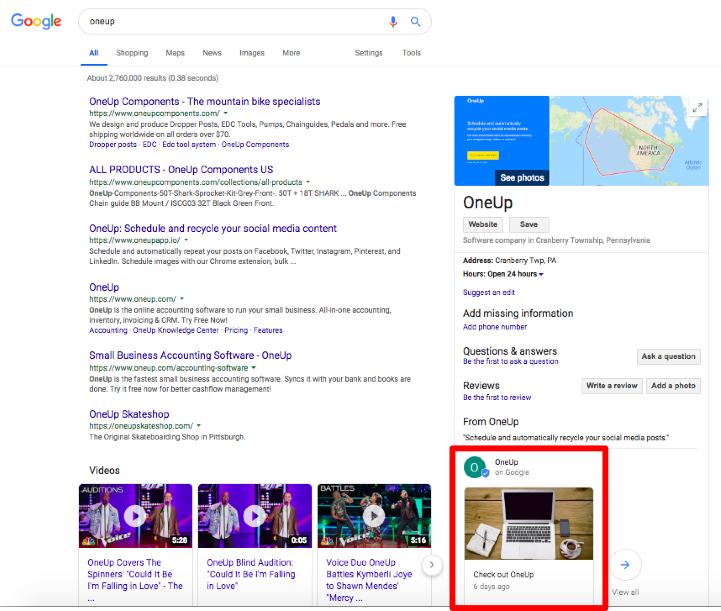 Google likes when you use Google products. 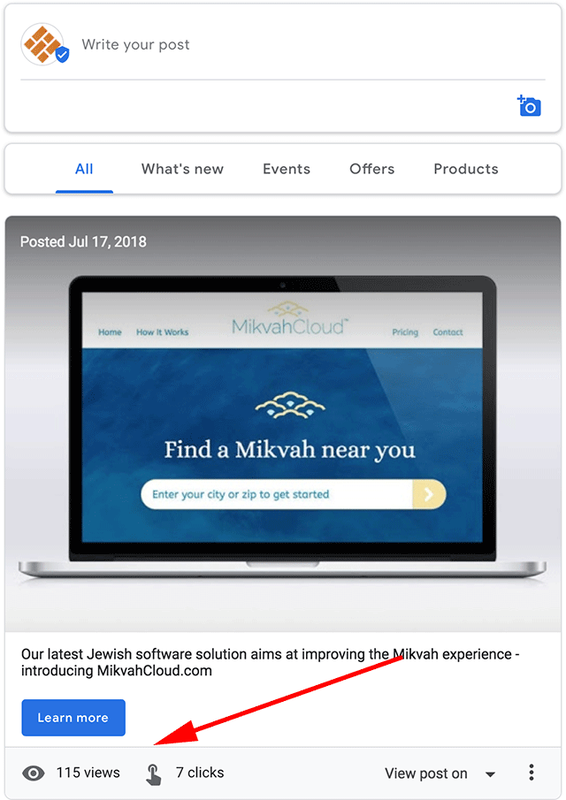 You can create ads directly in Google My Business. Do you have multiple people on your team? If so, you can add multiple users and assign different permission levels on GMB. For businesses with multiple locations, Google My Business allows you to add up to 10 locations manually. If you have more than 10 locations, you can request bulk verification by following these steps. 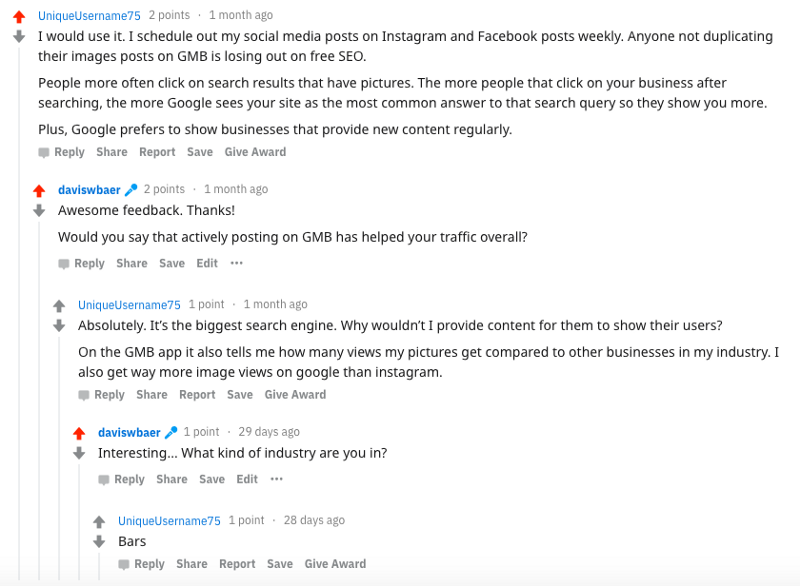 The fact that your Google My Business posts expire after 7 days means that you have to constantly go back into GMB and post something week after week, again and again. The solution: schedule Google My Business posts weeks or even months ahead of time. 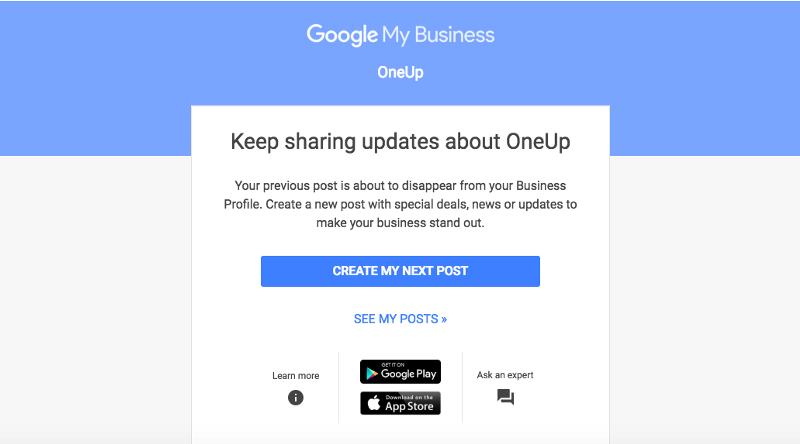 Using OneUp, you can schedule Google My Business posts for only $3/month (or $5/month if paid monthly). 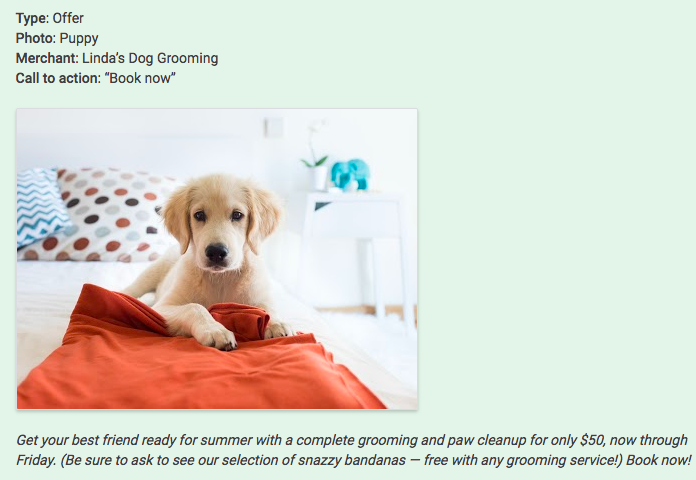 Then schedule your Google My Business post, optionally adding any link or image to the post. OneUp is only $3/month, and has a 7-day free trial with no credit card required up-front. Pingback: How can I post pictures on Instagram from my desktop computer? Pingback: What is a cheap Buffer alternative for scheduling repeating social media posts?